Venez nous rencontrer et découvrir nos aubaines chez le concessionnaire Fort McMurray Credit. Voyez ce superbe véhicule Dodge Durango 2017 usagé près de Fort McMurray. Inspecté et certifié par nos techniciens d'expérience, ce véhicule Gris indique 46152 km au compteur. Ce véhicule Dodge Durango 2017 usagée vous est offert au prix avantageux de 42500 $. Il s'agit d'un véhicule de type N/D, avec 4 portes, une transmission Automatique et une traction Intégrale (AWD). La Dodge Durango 2017 est muni d'un moteur utilisant de l'essence Sans plomb. Si vous souhaitez en savoir plus sur le véhicule Dodge Durango 2017 usagé à vendre à quelques minutes de Fort McMurray, n'hésitez pas à communiquer avec nous par téléphone au 780 464-0668 ou sur notre site web au http://www.fortmcmurraycredit.ca. <br/>Local SUV. One Owner. Accident Free. CLEAN CARPROOF. Immaculate Condition, Bluetooth, Nav, Backup Cam, Touchscreen, Moonroof, Power/Heated/Vented Leather Seats, Rear Heated Seats, Heated Steering Wheel, 3rd Row Seating, SiriusXM/AM/FM/USB/AUX/SD, OEM Remote Start, Power Lift Gate, Rear Heated Seats, 3rd Row Seating, 150W Outlet, HID/LED Headlights, LED Tail Lights, Power Windows/Locks/Mirrors.<br/><br/>Ready to take on your active lifestyle, this 2017 Dodge Durango R/T All Wheel Drive shown in Maximum Steel Metallic Clear Coat blends efficiency with best-in-class capability. Under the hood is a strong 5.7 Liter HEMI V8 with fuel saver technology that generates 360hp while tied to a class-exclusive 8 Speed automatic transmission with rotary shifter and steering wheel mounted paddle shifters. 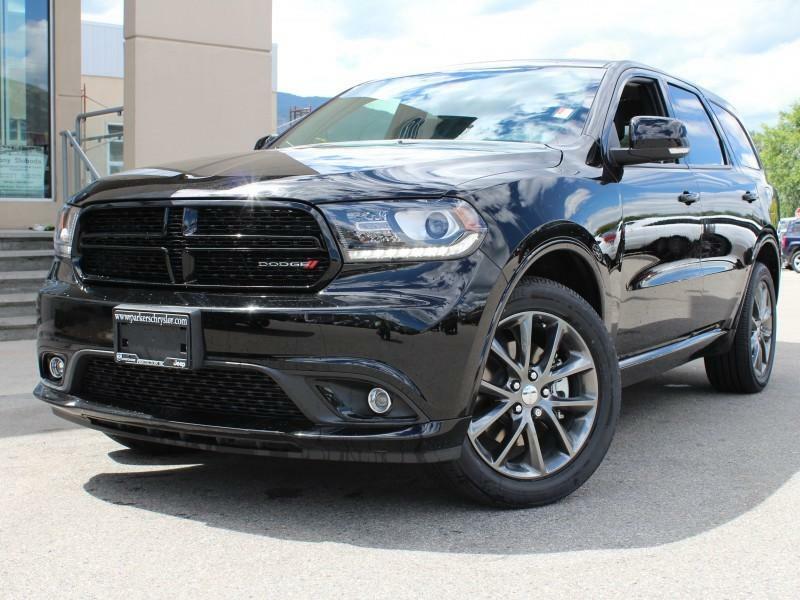 This team rewards you with near 9.4L/100km on the open road with acceleration that makes your pulse race.<br/><br/>You'll make a powerful first impression with the muscular stance of your Durango R/T. Once inside, you'll see that the interior is an indulgence for your senses with abundant soft-touch surfaces and bright accents that have been masterfully designed. Complete with heated leather seats featuring memorized adjustments, this seven passenger SUV is full of great style and technology. Check out the U Connect touchscreen display, crank up the Beats audio, or make a phone call with Bluetooth all while keeping your hands on the heated steering wheel.<br/><br/>You and your family will be well-protected with anti-lock disc brakes, stability/ traction control, trailer sway control, and an army of airbags. Designed with your family's adventures in mind, this is the perfect formula of beauty, brains and brawn that you'll experience once you get behind the wheel. Print this page, Come in for a Test Drive and Get a $25 Visa Gift Card... We Know You Will Enjoy Your Test Drive Towards Ownership! Bonjour, J'ai trouvé cette annonce sur Auto123.com. Pourriez-vous me donner plus d'informations sur le véhicule Dodge Durango 2017. Merci!